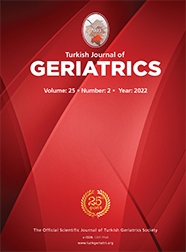 2Dışkapı Yıldırım Beyazıt Training and Research Hospital, Department of Nephrology Ankara Introduction: Very limited data about the quality of life in elderly hemodialysis patients are available. The aim of this study was to identify clinical and demographic determinants that influence health-related quality of life in elderly hemodialysis patients. Materials and Method: In total, 94 hemodialysis patients participated in the study. The participants were divided into two groups according to age: elder group (age of ≥60 years) and younger group (age of<60 years). Demographic and clinical data including age; gender; marital status; education period; duration of hemodialysis; comorbidity; and serum levels of hemoglobin, albumin, parathyroid hormone, aspartate transaminase, alanine transaminase, calcium, phosphate , urea, and creatinine were recorded. Health-related quality of life was measured using Nottingham Health Profile. Depression was evaluated using Beck Depression Inventory. Comparison of the data was performed between the groups. Determinants for quality of life were identified using multiple logistic regression analysis. Results: Elderly hemodialysis patients (n=39) had significantly higher scores in energy, pain, and physical activity domains than controls (n=55; p=0.008, p=0.016, p=0.042, respectively). In elderly hemodialysis patients, Beck Depression Inventory was significantly associated with the six domains of Nottingham Health Profile, excluding energy domain (p<0.05). Quality of life was significantly affected by factors including serum levels of hemoglobin, albumin and phosphate ; being married and number of comorbidities (p<0.05). The primary determinant of quality of life in elderly hemodialysis patients seems to be depression.